Stumbled upon these gems in the group and just had to feature them. Please take a look and support are fabulous writers. Written on the fly, this story packs a punch. It’s dogs vs cats and a whole lot more. Sure you can enjoy a polished story but the draft is the essence of a person’s inner thoughts and energies. It’s only afterwards we make it acceptable for the rest of the world. Today’s feature is slightly different. Since the dawning of Red Bubble, we have seen writers either come and go or stay on and shine before our very eyes. One of the writers who has been around from the beginning and doing very well for herself is Kate Smith (also known as Empress). Not only was her short story entry in the Unleashed07 competition a winner, she since has had a few stories published as eBooks or in online ezines with various independent publishers. Her stories can be found at Mobipocket, Fictionwise and with publisher Mystic Moon Press. You can also listen to her story “Bad Hair Nights” via Parade of Phantoms or if you wish to read the story, purchase a copy at MMP. 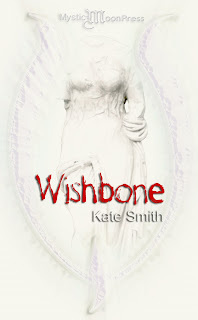 One of her first and successful stories with Mystic Moon Press is Wishbone. A mystery/crime/fantasy wonder mix. “I love blending flashing dialogue between two characters with an ensemble cast, even if most of them are off stage for most of the action. It’s my way of building a world and inviting the reader in…” says Kate. Ariel Thorne does not believe in coincidence. She doesn’t believe in curses either. Wishbone has since called out a related story titled Zap – Pandora’s Edge. “Zap for example takes place during the first half of Wishbone; one of my first published stories The Dominant Rose links to the last chapter,” Kate explains. Looking forward to seeing this instalment. Kate is a work-horse when it comes to writing that I sometimes wonder if she has time for anything else. At Red Bubble, she co-hosts the Short Stories – Spherical Scriptings group with Damian (who has been featured here previously) and has been involved in collaborations with other artists. One of the collaborations has opened the way to her new blog site The Sirens Gate. As you can see, Kate truly is a motivation for writers. Blog posts will also be shown in the mini feed section of the profile as well. Features and information about the group can now be found in the audio version of the blogazine at Blog Talk Radio. The first audio introduction of the feature to go live will be on 21/05/08 at 15:00 pm EST, Sydney Australia. The introduction is 4:00 minutes or so in total, featuring two tracks from Sungod Abscondo’s forth coming album and one from TX DJ. All can be found at Jamendo.com. NOTE: This is a test run and may/will contain technicalities on the day. If it runs well, I’ll see if it can continue as a regular feature. Today we feature a story titled The Blue Vase by Hilary Dougill. A light, heart felt story about family relationships and love. ‘Mother. How could you?’ challenged Virginia and Cicely together. ‘The man is a guest in the house. You saw him at lunch for God’s sake Mother.’ said Cicely. ‘And to threaten someone with a loaded gun is awful.’ said Virginia. Hilary is professional psychologist who lives in a small market town in the United Kingdom and has a PhD in Natural Medicine. Photography and writing are her hobbies. Today we feature a serial story titled Shades of Gray # 1 by Gayla Drummond. A story of raw intensity, passion and gripping hooks that make you want to go to part 2. Great stuff Gayla, really well written, and so engaging. well i’m hooked!…..off to the next bit! really felt my heart go when she thought he’d cheated! I’m enjoying reading your work; it is articulate, well polished, and flows nicely. I especially like the mood, the hint of suspense. Marvelous work!! “Gray, I can’t just,” I begin protesting, but a finger touches my lips to silence me. His dark brown eyes gaze intently into mine. Gayla has had a few titles published which are equally riveting. Her recent work up for grabs is Feral Intensity; the first of a three part contemporary fantasy. She also has had works published in “ArtWanted.com’s Creative Minds”. Aside from writing, she is a CG Artist with six years experience. Her cover art has been used for works such as Flash Swords Fantasy Magazine. At Red Bubble, she co-hosts the “A Novel Idea” writing group.